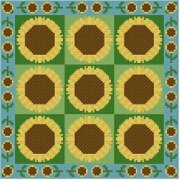 This design is neatly divided into 9 squares, each showing a sunflower on a green background. The border carries through the theme by showing sunflowers all around. All whole stitches are used in this design that could be used as a quilt block with or without the border.